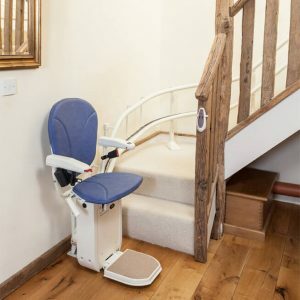 This Brooks 180 curved stairlift in particular is designed for even the most complex of staircases, and with its unique modular rail system it can be installed as quickly and easily as any of our curved stairlifts! Here at Multicare, we understand the difficulties that reduced mobility can bring. That’s why we make sure that we have so many top quality brooks curved stairlifts on offer at unbelievable and unbeatable prices, such as this Brooks curved stairlift. 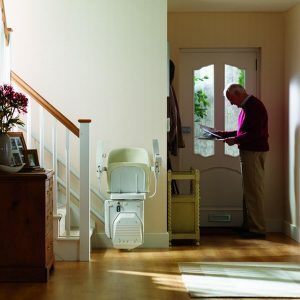 Every product we have offers a safe, simple and comfortable solution to making the often painful trips up and down the stairs a thing of the past, and that’s why we’re number one for stairlifts in the UK. Every Brooks curved stairlift we have is tested to ensure that they achieve the highest of safety specifications as any other product from our stock of , coming with their own maintenance-free DC battery packs which continue to work even through a power cut. 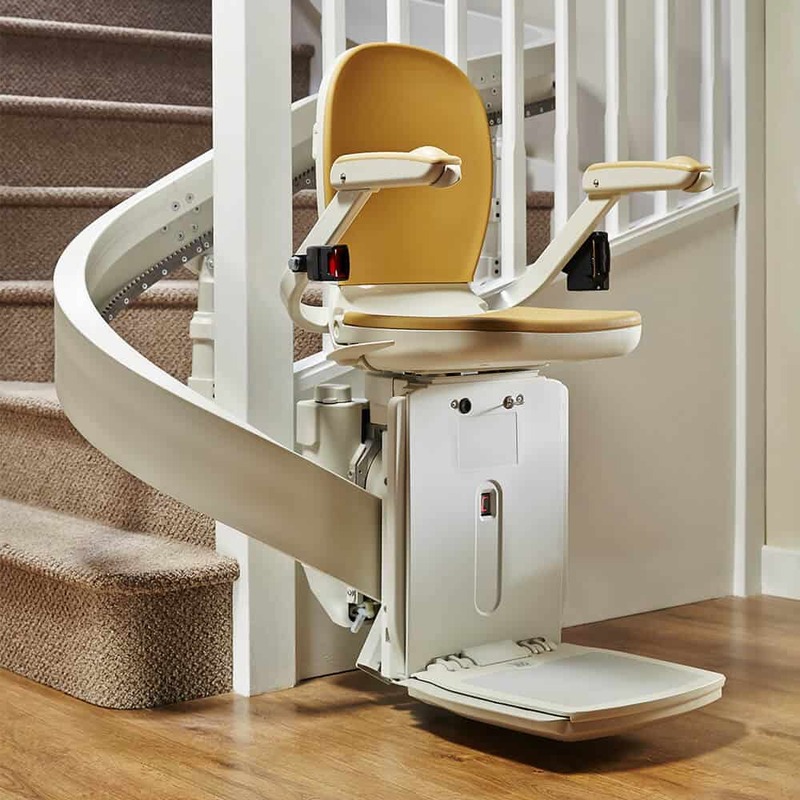 You’ll never have to worry about these brooks 180 curved stairlifts letting you down! 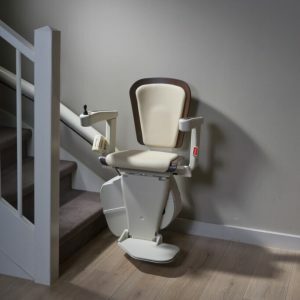 This fantastic Brooks curved stairlift also includes an on-board digital display which is easy to read and will alert you of any pending issues before they arrive, but that’s far from the only features we’ve managed to pack into it! The directional switches require the most delicate of touches making it easy to use for everyone. The arms, footrest and seat all fold away to save space on the stairway, as with all of our brooks 80 curved stairlifts. This incredible Brooks curved stairlift is fitted with a seatbelt for added security. With a padded seat this Brooks curved stairlift gives the most comfortable ride available. 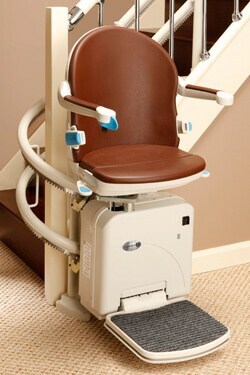 The footrest features sensors which will stop the stairlift in the event of an obstruction. 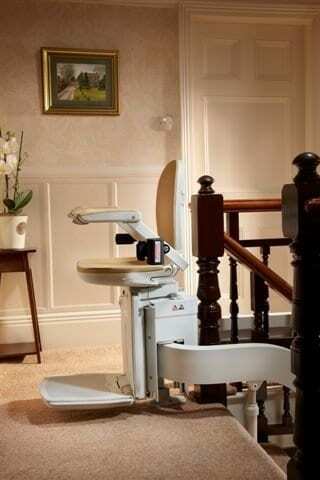 Wireless remote controls allow the stair lift to be called or sent from the top or bottom of the stairs.